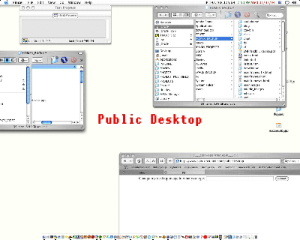 Public Desktop – 2004 | JONAH BRUCKER-COHEN, PH.D. Public Desktop – 2004 – JONAH BRUCKER-COHEN, PH.D.
PublicDesktop added sociability to the Mac OSX desktop background by allowing people to input text online which then becomes the desktop image. The idea is to create a social space in the seemingly closed off desktop environment by creating a simple message board that emphasizes background awareness communication. If two people are running the main application, it becomes a desktop IM client of sorts. Future versions will include image lookups and other types of live inputs as desktop images. S.T.R.U.K.T.U.R @ Artist Network, NYC, NY from 5/7/04 to 6/7/04. Institute of Contemporary Art (ICA), London, UK from 3/10/04 to 4/1/04. Play Shop in San Francisco, CA from 1/17/04 to 4/4/04. The PublicDesktop application was available for download. Included was a Read_Me file that explained how to install this on your computer. The system only worked in Mac OSX. The project might be upgraded / rebuilt at some later date. Public Desktop is a project that looks at expanding the seemingly closed off desktop background of the computer into a public one that can be annotated by anyone online. The idea is to add sociability to the desktop through a public web form that turns your desktop into a public graffiti wall where people can leave messages, post thoughts, or use as a chat client. 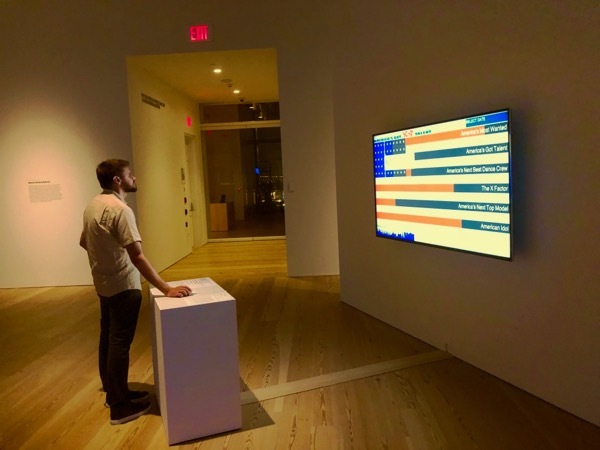 The real aim of the work is to create a sense of connectedness among people in a background way where glancing at your screen might reveal a new message someone has left. This is different from conventional messaging systems since it requires no direct action of communication from the person who has the PD application running. They can simply install the project and watch as their desktop is annotated in real-time by people visiting their website.